New Zealand has made the headlines this year, for all the wrong reasons. The devastating earthquake that hit Christchurch in February 2011 brought this tiny country on the edge of the world into the nation’s living rooms. It was a salient reminder that New Zealand is a geological hot spot, sitting astride the Pacific and Australian Tectonic plates. Literally days before the earthquake struck, I returned home from a visit to New Zealand, where I participated as a speaker at two of the country’s most enjoyable wine events, The Central Otago Pinot Noir Celebration and In Praise of Riesling in Waipara. This was my third trip to New Zealand in four years, and was a chance to focus on the South Island and visit several top wine producers. Some of those I visited were directly affected by February’s events, but despite that, the fast-paced rate of development and change in New Zealand goes on. The map right shows the regions visited for this article. Undoubtedly New Zealand’s best known wine region, Marlborough is home to some of the most distinctive Sauvignon Blanc on the planet. Marlborough created the first genuinely new style of Sauvignon outside of its Loire homeland, and that style is now mimicked across the globe. And yet, as previously discussed on wine-pages, there is a concerted effort by producers to expand that picture and avoid the potential pitfalls of being so reliant on one grape, and no matter how popular, one style. There are new styles of Sauvignon Blanc that are fermented with wild yeasts, aged in oak barrels or blended with Semillon, and there’s a continuing focus on Pinot Noir as well as more emphasis on other grape varieties. Marlborough remains a viticultural paradise, and one where the differing sub-regions and their terroirs are also being better understood and better expressed in the wines. My trip began with a visit to the HQ of the region, Wine Marlborough, where manager Marcus Pickens arranged a tasting of 40 wines to allow me to benchmark where this region is going. Marcus also shot the little video asking for my reaction after the tasting. The generic tasting of 40 Marlborough wines that clearly showed the expanding horizons for grapes, terroirs and styles. Maestros of Riesling, Framingham’s new ‘F Series’ wines could be considered in the ‘natural wines’ category. The family-owned Hunter’s, led by Jane Hunter, is considered a pioneering force in Marlborough Sauvignon. From the legendary Kevin Judd, the man who made Cloudy Bay, and whose new wines are going down a storm. The solo venture of winemaker Fiona Turner who has made some of New Zealand’s most highly-regarded wines. 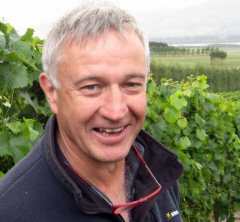 For many years Fiona Turner’s winemaking partner, Matt Thomson is partnered here by Brit David Gleave MW. Just north of the South Island’s capital city, Christchurch, lie the vineyards of Waipara and Canterbury, which together comprise New Zealand’s fourth largest viticultural area. Claiming to be the fastest growing wine region in New Zealand, around 80 vineyards cover more than 1,200 hectares in Waipara alone. Waipara’s soils include gravely deposits on flats and terraces in the centre and west of the valley, limestone and clay on hillsides and valley floor to the east and gravely loams over alluvial subsoils in the south. Riesling, Chardonnay and Pinot Noir currently get most of the region’s focus. 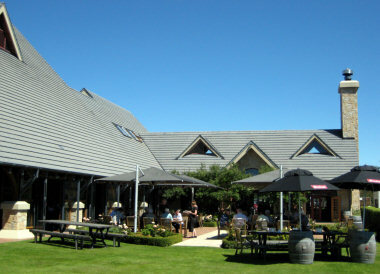 Right: a perfect summer’s day at Waipara Hills’ vineyard restaurant. I did manage to visit a few of Waipara and Canterbury’s best producers as you will read below, but one of the main reasons for my visit here was to attend the annual event called ‘In Praise of Riesling’. IPR is a fantastic celebration of the Riesling grape, not just for the producers in Waipara, but across New Zealand. I spoke on a panel presenting a blind tasting of Rieslings from around the world, but there are also notes on a Regional Riesling tasting featuring 40 wines, plus notes from a fascinating tasting of a project called ‘The Riesling Challenge’, in which 12 different wineries from across New Zealand took fruit from the same vineyard, harvested on the same day, and made their own interpretation of it. But other than Riesling, it is with Pinot Noir and Chardonnay that Waipara and Canterbury are establishing the greatest reputation. This is one of very few regions in New Zealand to boast limestone soils, which is the bedrock of many of Burgundy’s most famous vineyards. A generic tasting, this time of 40 examples of Waipara Rieslings, the wines running the gamut of dry to sweet styles. Twelve wines, twelve winemakers, one batch of grapes. Evidence of terroir, or the hand of man? A test to sit and speak on this panel led by Bob Campbell MW, exploring international Riesling in a blind tasting. One of the most discussed wineries in New Zealand. Mike and Claudia Weersing make uncompromising ‘natural wines’. Dayne & Jill Sherwood run a very smart and successful operation, with moderately-priced wines that deliver high quality. Two big brands under the same ownership, making and impressive range of wines from Waipara and other key regions. The mesmerizingly beautiful region of Central Otago has soared to the top of New Zealand’s tree in recent years, both as a must see destination (helped in part by the Lord of the Rings trilogy being filmed there), but also as a hot-bed of Pinot Noir production. Even in the five years or so since I first visited the main urban centre of Queenstown it seems to have mushroomed in size and the sheer number of visitors based in, or passing through, is staggering. .
Central Otago is the world’s southernmost winemaking region, and one of the world’s great travel destinations. A landscape of dramatic, jagged-toothed and permanently snow-capped mountains rings glacial, still lakes that reflect every contour and colour perfectly. Basking in sunshine all summer, it transforms to skiing paradise in winter, meaning the vibrant towns like Queenstown and Wanaka are bustling with life. The large extension to Queenstown airport, turning it from one-roomed shack to a proper terminal, has happened since my first visit just a few years ago. 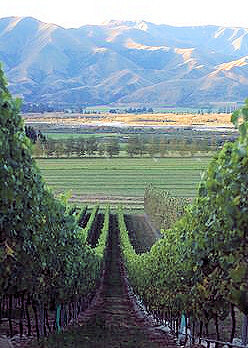 (photo © New Zealand Wine) Vineyards lie in lush, green basins and valleys between the mountains, running into the foothills where they brush against the alpine scenery. The Cromwell Basin is the largest sub-region, split further into distinct territories that are now familiar on the labels of bottles such as Bannockburn and Bendigo. The Gibbston valley is another extensive area, where the north-facing slopes allow greatest sun exposure. Minor sub-regions include Clyde, Alexandra and Wanaka. It’s mind-blowing to think that the first commercially released Pinot Noir from Central Otago was from the 1987 vintage (pioneering Alan Brady is still very active on the wine scene). A history of less than 25 years is nothing in wine terms, and Central Otago has had to do a lot of growing up, and to do it fast. The world does not have too many Pinot Noir hot-spots outside of Burgundy, so when the evident quality of the region’s wines burst onto the international scene in the 1990s, a global spotlight was thrust upon the regions winemakers and their wines. That kind of scrutiny on such a young region could have been unbearable, but in fact there’s a terrific sense of confidence, unity and strength amongst the producers here. They have literally grown-up together – and together with their vineyards. Though aromatic white varieties including Riesling, Pinot Gris and Chardonnay play an important part in the scene in Central Otago, Pinot is king. And the first of my reports is from a fantastic festival of the grape that takes place over several days in and around Queenstown, called the Central Otago Pinot Noir Celebration. Tastings, seminars and dinners pack the schedule with wine lovers and makers from across New Zealand and the world in attendance. This year I spoke on the International panel at a tasting of Burgundy wines (this festival is by no means focused only on local expressions of Pinot), so a report from those is included too. The fantastic purity of fruit that so many people remark upon in Central Otago Pinots is still very much in evidence, and I was delighted to see that the tendency to over-extract and aim for ‘bigger’ wines for the top cuvées and single-vineyard special wines has receded since my last visit five years ago. I found a delightful freshness and surety about these wines. Central Otago has not been immune to the problems of increased supply and static demand that have beset the New Zealand industry as a whole, and just as in Marlborough, there are Central Otago wines appearing a prices lower than would have been imagined a few years ago. And yet the top estates continue to refine their wines and draw more character from their terroirs, meaning their prices are holding up and the wines continuing to show starry promise. The main Central Otago Pinot tasting where around 40 wineries showed their current and one previous vintage. One of the masterclasses told three personal stories through wine. First up: Rudi Bauer, winemaker for Quartz Reef. Blair Walter, winemaker at Felton Road since it was founded, presented four wines back to the 2000 vintage. Matt Dicey of Mount Difficulty brought the journeys to a close, with winemaker, who helped plant the first vines in 1993. Exploring whether Burgundy terroir owes more to natural geography or the cartographer’s pen. Because of flight timings I missed most of this intriguing tasting of Pinots from other New Zealand regions. It became a running joke as I traveled through Marlborough, Canterbury and Central Otago. Whenever people asked me where my journey would take me next I’d give them my itinerary, which ended up in the Waitaki Valley. The reaction was always the same: “Oh, Waitaki? That should be interesting – I’ve never been.” I began to joke that perhaps Waitaki did not exist at all, but was some cruel practical joke played on innocent Scottish wine journalists, sending them on a pointless four hour drive into the South Island’s hinterland. In fact, not only does Waitaki exist, but this proved to be the most fascinating adventure, discovering a little chunk of New Zealand’s most recent wine history, and one where the story is still in its very early days. It was a visit full of questions that could not be answered by me, or by anyone at this moment in time. Waitaki is an extraordinarily beautiful, but remote and marginal vine growing valley between Canterbury and Central Otago where the destructive power of frost is a constant danger in the Spring months. But big names have been drawn to the area in search of fruit, including Craggy Range and Forrest Estate. The specific draw has been Pinot Noir, because Waitaki’s secret is limestone soils, the holy grail of Pinot growers and rare as hen’s teeth in New Zealand. I was meeting up with Jim Jerram (left) and his brother-in-law Jeff Sinnott, partners and CEO and winemaker respectively at Ostler Vineyards, the pioneers of the region who first scoped out the land’s potential in the late 1990s, and were amongst the first to plant vineyards in 2002. It is clear to see the struggle of the past decade etched into Jim’s handsome, craggy features when he describes Ostler’s journey, and yet he seems unflappably confident too. But then Jim is every inch the action hero. A qualified pilot, he spent 29 years as a doctor, including two years working for Sir Edmund Hillary’s Himalayan Trust hospital in Nepal as sole charge doctor. Nothing much phases him, and he is quietly determined to make the Ostler story work. Softening prices for New Zealand wines plus the difficulties associated with growing vines in this region had contributed to a few bad new stories just at the time of my visit: rumour had it that both Craggy Range and Michelle Richardson (ex-Villa Maria winemaker now with her own label) had pulled out of Waitaki. Jim showed me the vineyard plots from which they had previously taken fruit, looking un-pruned and a little forlorn. It was obviously a blow to the confidence of Jim, Jeff, Jim’s wife Anne and father Paul, all of whom have invested a decade of time and money in establishing their Waitaki dream. Driving out to the Ostler vineyard it is easy to see why this project has got under the skin of the team here, and why they still have confidence that it’s the right place to be making premium New Zealand Pinot and aromatic whites. We pass large outcrops of limestone protruding from grassy banks, and we stop in the little town of Kurow where Jim has set up a cute little wine tasting and sales room showcasing most of the region’s wines. But it is when we reach the Ostler vineyard that the magic really starts to take hold. This is a beautiful sloping site (photo above) framed by mountains and braided rivers, where the vines are given every chance of catching this southerly sun. 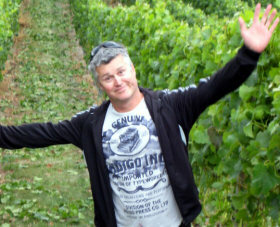 Winemaker Jeff Sinnott (showing his more serious side, right) who has worked for star names Milton Vineyards and Isabel Estate, as well as Au Bon Climat in California, enthuses over the north facing limestone slopes, a 38 million-year-old seabed that was pushed up by an ancient geological fault. It’s also a ‘clos’ in the Burgundian mould, with a beautiful limestone wall painstakingly built by a local retired craftsman, 74-year-old Roy Stringer, that surrounds the vineyard. Jeff acknowledges the difficulties of maturing fruit here, and indeed the entire 2007 crop was lost in severe frosts, but the label kept going by purchasing fruit from other nearby regions. Ostler’s has recently established a second site too, Lemon Springs, which sits 24 kilometres further inland on Lake Waitaki, and where alluvial gravels and a warmer site will spread the risk a little further and will be ideal for aromatic white varieties. I left, after spending a fantastic evening with the Jerram and Sinnott clan, thinking not only that this unique location was indeed capable of a particularly fine and elegant expression of Pinot Noir, but that here was a family business being run with huge integrity and passion that I think will, and certainly deserves to, find great success. A tasting of wines from Ostler’s current and back catalogue, including three vintages of their top ‘Caroline’s’ Pinot Noir, made only in the best years from the original Ostler vineyard.